The Nemesis of Crime returns in classic 1940 pulp novels by Norman A. Daniels and The Spider's Norvell Page. 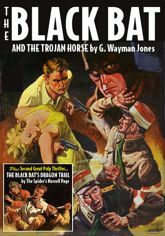 First, murderous foreign agents make a deadly attack on America's prewar defenses in "The Black Bat and the Trojan Horse," an action-packed thriller edited by future Batman editor Mort Weisinger! Then, the Scourge of the Underworld foils the Dragon Master's nefarious plans in "The Black Bat's Dragon Trail," as Tony Quinn attempts to prevent the exploitation of China by a war profiteer! Plus, the Mask returns in a Golden Age classic from Nedor's Exciting Comics #6.